Canterbury Cathedral’s main tower seen from a neighbouring narrow street. 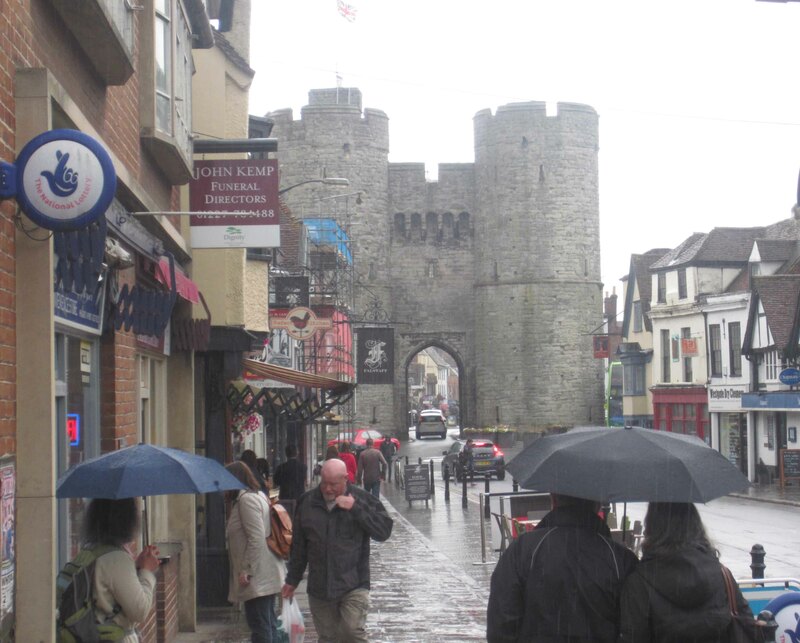 It was still raining as we walked into the pilgrim city of Canterbury through its medieval West Gate. 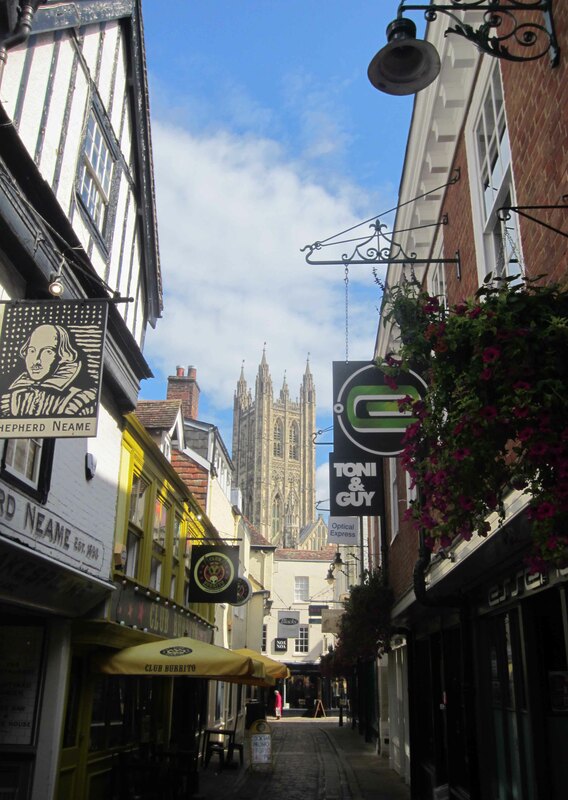 Canterbury is not a big city (it has a permanent population of around 50,000 which rises to around 80,000 during university term time) so it didn’t take us more than fifteen minutes to stroll through its narrow streets to the city centre. But in the space of that fifteen minutes a miracle happened. The rain-filled clouds that had sagged above us all day – in fact for the previous two days – suddenly shrank away to the edge of the sky. We walked through Christchurch Gate into the yard of Canterbury Cathedral and stopped in astonishment. The ancient building was glowing tall, spiky and golden in a flood of warm sunlight pouring over it from a clear blue mid-afternoon sky. Of course there are annoying, cynical academic types who will say this was not a miracle. Britain’s weather is very changeable and what happened was a routine meteorological event. It had nothng whatever to do with our arrival. Religion, they will say, is an alchemy of symbols and rhetoric that can transform the mundane, the trivial, the impossible, not to mention the downright bleedin’ obvious, into a mind-blowing miracle. … and fifteen minutes later, Canterbury Cathedral bathed in sunshine against a blue sky. A miracle, just for us. But what do they know? The pilgrim sees with the sharp vision of hope, the rationalist sees with the narrow, picky vision of evidence-based science clouded by an excess of data, cushioned by the comforts of hindsight, and aware that scientific “truth” is never final, perfect or uncontestable. In the spirit of imperfect scientific enquiry I decided to attend the daily ritual of Evensong. So towards half-past five that afternoon Emmy and I entered the cathedral and stood on the gleaming flagstone floor looking up open-mouthed at the vast vault above us. The tourists had been cleared out and a resonant silence filled the airy interior. We went up several wide stone steps into what is called “the quire.” Here several rows of dark wooden pews lay lengthways on either side of the stone floor. They were slightly raked one behind the other like seats at a tennis court. Vergers in long, swinging black robes paced up and down solemnly ushering worshippers to their seats. We opened a little wooden gate at the end of one pew, squeezed in and took our seats in carefully nurtured silence. Around 100 people were in attendance. The Quire where Evensong is held, with ranks of pews facing each other left and right, and the lectern for scripture readings bottom centre. A river of mellow organ music flowed gently into the quire in intricate melodious eddies. We couldn’t see the pipes or the organist, the music was just there, part of the ambience. At precisely 5.30 everyone stood up and twelve all-male choristers (in a bizarre touch they are officially called “lay clerks”) filed in wearing long white smocks with split sleeves draped over black full-length cassocks. The procession forked into two groups of six, each entering a pew that faced the other across the floor. A priest – a woman – welcomed visitors and extended a special word of welcome to newly arrived pilgrims. The Evensong service got under way with a contrapuntal “responsory” in which the two halves of the choir spoke musically to each other. The bass, baritone, tenor and counter-tenor (falsetto) voices danced slowly and delicately around one another in an elaborate, gravely beautiful musical gavotte. This was followed by versicles intoned by a choir member in a high, half-spoken half-sung monotone and responses intoned in similar style but with extended contrapuntal elaboration by the rest of the choir. The cathedral itself seemed to sing an ethereal third line of counterpoint in the faint resonances it sent back from its walls and windows. Then came the first reading, the opening verses of Psalm 14. I sat up and paid attention. This was getting personal. They are corrupt, they have done abominable works, there is none that doeth good. No not one. The Lord looked down from heaven upon the children of men to see if there were any that did understand and seek God. But they had all turned aside, they had all been totally corrupted. There is not one that doeth good, no, not one. I suppose I should have been chastened by these tough-love words, so obviously true in my case. But I was not humble enough. Inwardly I nodded, but outwardly I looked as indifferent as I could and returned to enjoyment of the music. The choir of Canterbury Cathedral is deservedly world famous. The disciplined passion of its singing is striking. Its gentle surges and passages of repose are beautifully modulated. Everything is balanced, pure, harmonious and serene. The singers are artists of the highest order. Evensong ended with the normal Anglican-Catholic confession of faith (which I allowed to pass by me completely of course) and the singing of Nunc Dimittis (Now go forth), a simple and powerful dismissal that encapsulates the spirit of Christianity as it rose in Palestine two thousand years ago. The following day Emmy and I returned to the cathedral to have a good look around inside and out. Again we stood transfixed in the long hall of the nave. Far above us the stone ribs of the walls bent inwards on either side and splayed like palm fronds to intertwine in an ornate pattern of criss-cross curves and circles down the length of the ceiling. Between the trunks of stone embedded in the walls, narrow stained glass windows cast glittering glances of bright blue and red light into the bower-like space of the nave. The main nave of Canterbury Cathedral. To give you an idea of its dimensions, the tiny figure standing in the aisle before the altar is Emmy. 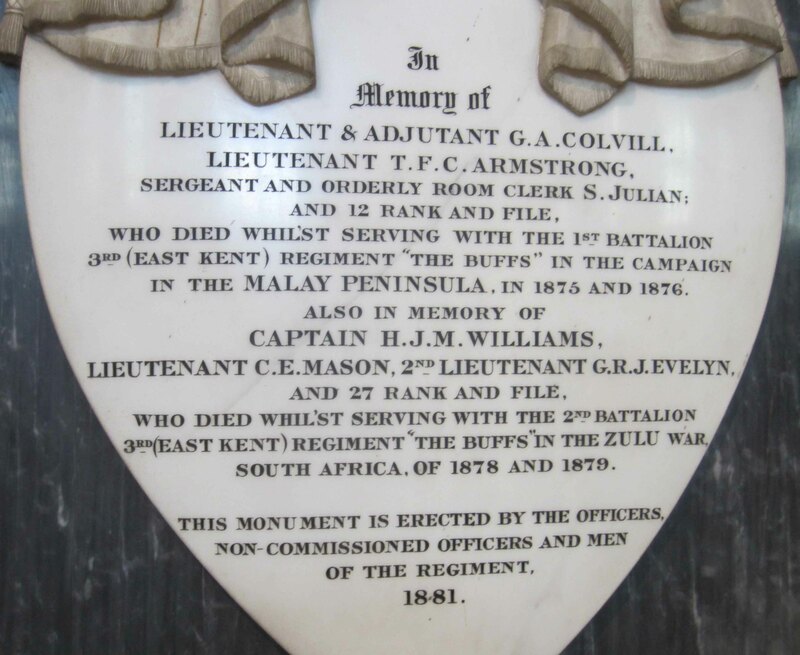 An imperial war in distant Southeast Asia and another in South Africa are commemorated in this tablet. I suppose you can argue that by condemning these violations of basic Christian teachings I am judging the people and events of history by values that were not current at the time. This would not be true. Nothing is more basic to Christianity at whatever time in its history than “You shall not murder” and “Love your enemies.” Christian pacifists (i.e. those who try to live by the values taught by Jesus Christ) have always been present at all times in history, but they have been ignored, or treated with contempt or ruthlessly eliminated by the hypocrites of mainstream “Christianity”. Saint Augustine (354 – 430) exhausted much of his considerable brain-power thinking up justifications for war and his thinking has been influential. Even today, as many protest at religious justifications for war and religious excuses for murder, the Augustinian nexus between the “Christian” establishment and the waging of war remains unbreakably strong. 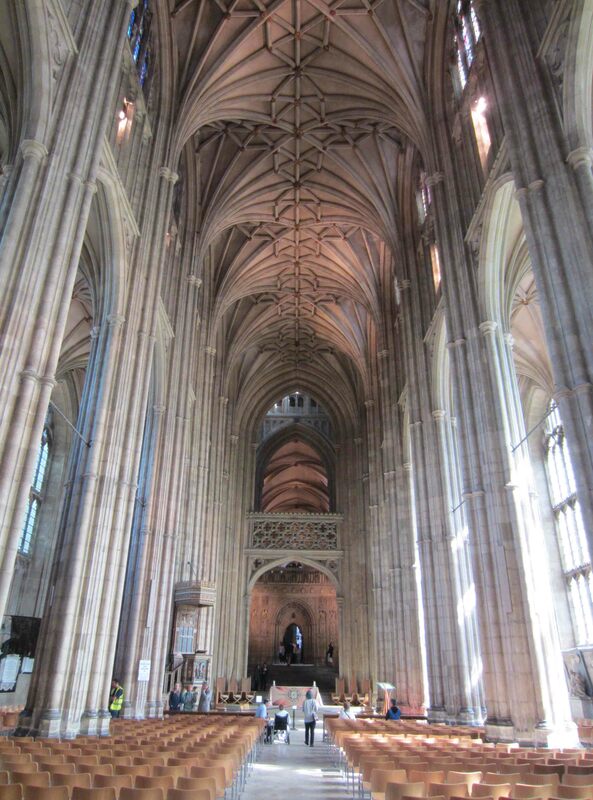 Much of Canterbury Cathedral’s allure down the ages comes from the events of 1170 when its archbishop Thomas Becket was assassinated inside the cathedral by agents of King Henry II. Today the gory details of the murder are told with special relish. By my count we heard three times during our visit that an assassin’s sword lopped off the top of Becket’s skull leaving his brain exposed. Apparently Becket was still alive at this moment, but one of the assassins then dashed the archbishop’s head against the floor scattering his brains and blood over the flagstones. Visitors can stand at the exact spot where this happened, as I did, but I was examining the floor so closely I forgot to take a photo. Within two years of his death Becket had been appointed a saint and his grave in the apse of the cathedral became a popular place of pilgrimage. But 350 years later King Henry VIII changed that. In his campaign to purge the Catholic faith and the Pope’s authority from England he ordered that Becket’s remains be dug up, his bones pulverised and the tomb destroyed. In later centuries, with the decline of religious bigotry, pilgrimage to Canterbury Cathedral resumed. The absent tomb of Saint Thomas Becket, marked by a single candle in an empty space. On the afternoon of Wednesday, September 2nd I reached the end point of the English Camino. 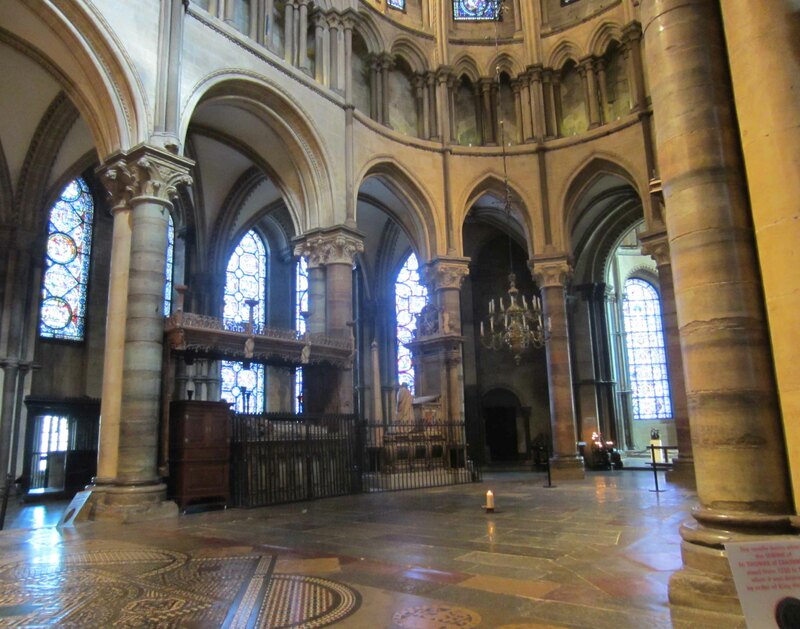 The spot where Thomas Becket’s tomb once stood – now called Trinity Chapel at the far end of the cathedral – is marked by a single candle standing on the floor at the centre of an empty space. There are no remains, there is no tomb. As I stood there a small crowd of pilgrims pressed around me. Faith creates its own reality. If the tomb had still been there it would have been seen as proof of Becket’s sanctity and the truths he stood for. But for some, apparently, its eerie absence under the cathedral apse is even more convincing, even though all that remains of Becket now is a mirage of stories. 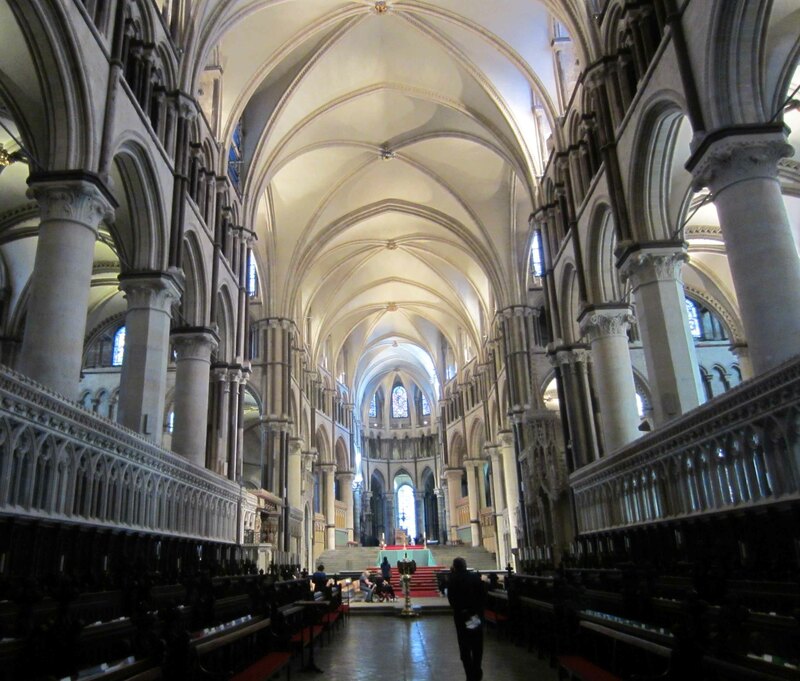 Perhaps (I am hoping) some pilgrims may ask themselves whether Canterbury Cathedral’s final emptiness – the absence at the heart of its magnificence – tells us something useful about the character of religious faith. As Emmy and I walked the streets of Canterbury city we couldn’t help but notice the pervasiveness of Chaucer and pilgrimage in the city’s place names. We walked past another final destination in the pilgrimage of life, a retirement home for ladies and gentlemen called Pilgrims Lodge (at number 10-12 Pilgrims Way). 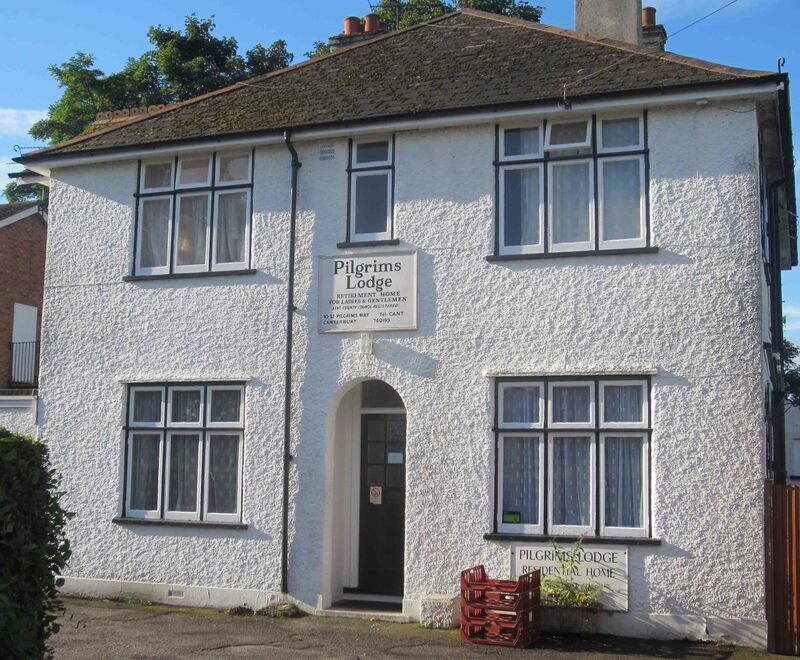 A retirement home for elderly ladies and gentlemen at the end of life’s pilgrimage: Pilgrims Lodge on Pilgrims Way. It took just a single glance from Emmy – no more than a nano-second – and yet another of my brilliant ideas was shot down in flames. 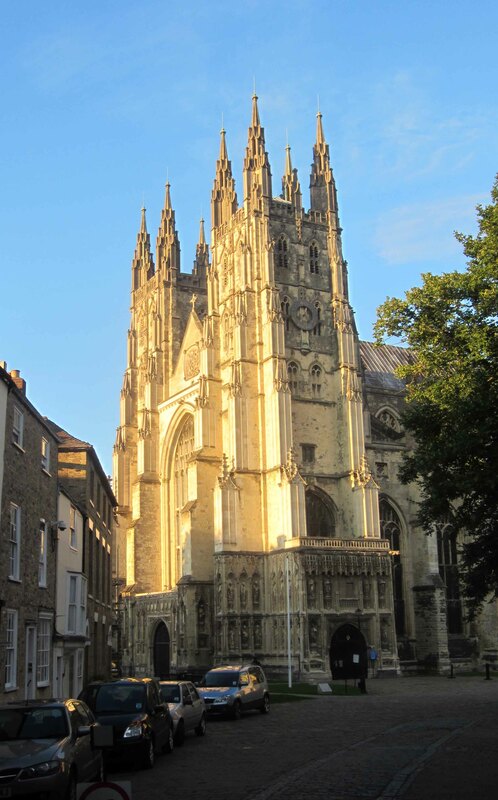 This entry was posted in North Downs Way and tagged Canterbury Cathedral, pilgrimage by George Quinn. Bookmark the permalink. Loving the Posts. Seems like all those Sunday mornings listening to Rev Richards sermons at the Newtown Presbyterian Church made not one jot of difference. Yes, they did make a difference, Max. They taught me to be wary of pulpits. Barry having spent over 20 years living in Harbledown (Herbal down, place of growing healing herbs for casualties, especially lepers, returning home from the Crusades) 20 mins walk from the Cathedral, has enjoyed your tales. So glad the heavens did their bit in illuminating the great pile for you. A wonderful photo. But I want to ask if you both went below the ground level to the ‘Undercroft’ which to me is the heart of the cathedral and has strong references to the lands of the Crusades with pillars as palms. It also has a very old ‘Lady Chapel’ whose roof has traces of the original red, blue and gold paint which enlivened the surroundings. The Undercroft provided shelter to Huguenot refugees at some distant date – how good if the place were again to give sanctuary to some Syrians. Hi Virginia. Yes, we did go into the crypt or “undercroft” under the main hall of the cathedral. Thomas Becket’s tomb was located there for a while. And we did see where the Huguenot chapel was, both from outside of the cathedral and at its inside entrance, though we didn’t go in (it appeared to be locked). I don’t recall the palm-like pillars, but we did see some old fresco paintings in (if I remember rightly) St Gabriel’s chapel. But photography is forbidden down there, so I couldn’t get any images to jog my memory and I left it out of the post. And yes… it would be great if Canterbury could again become a place of refuge. I think the Anglican Church is pushing the UK government to take in more refugees. If they could camp in the cathedral… wouldn’t that be good (provided it was not a permanent arrangement!). Glad Barry is enjoying the posts… one or two more to come, before my memory blanks out completely. Me too, David. I’d love to end my days swapping yarns with other superannuated pilgrims. But I guess I’ll just have to settle for the suburbs of Canberra. Salam to Krishna. Excellent account, and made all the more interesting by your impressively complex relationship with things religious. Keep up the good work! Thanks Lois. I’m a simple bloke really. What’s complex is the phenomenon of religiosity. Is the new organ in place yet?